New Delhi: “Our blood is very cheap when it comes to our dignity and sovereignty on our land”, said H.E. 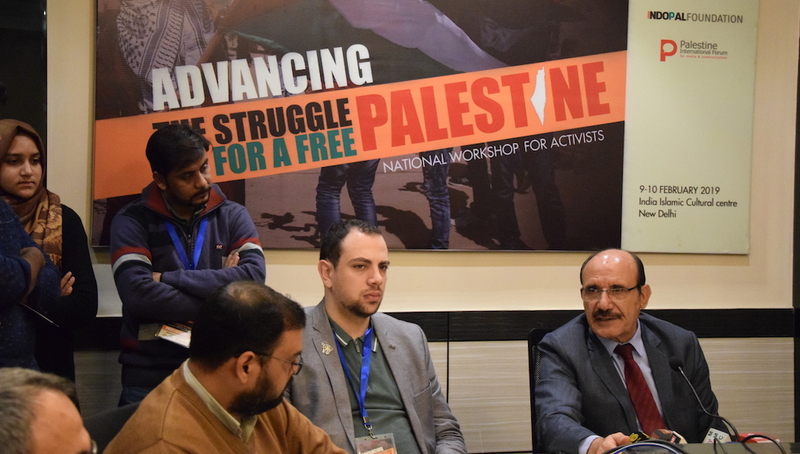 Adnan Abu Al Haijaa, the Ambassador of Palestine in India in the two days workshop on the theme ‘Advancing the Struggle for a Free Palestine’. The event was organised by IndoPal Foundation in collaboration with India Palestine Friendship Forum and Palestine International Forum for media and communication, at Indian Islamic Cultural Centre in the capital of India, New Delhi. He talked about various historical and aspects of the Palestinian struggle and its diplomatic relations with India. Discussing ‘Deal of The Century’, he said that the plan has not been released yet and the details of the Deal is not received by them yet. He said that one thing is clear that the ‘Deal of The Century’ will not be a road to peace in Palestine and only Trump and radical American Zionist cannot decide it single-handedly. Ajit Sahi, Senior Journalist of India and the Chairman of IndoPal Foundation said, “Palestine is the freest place on the Earth. Even though they have lived in captivity for decades, their minds and souls are free”. While discussing on ‘(Re)Building A Just Discourse on Palestine in India’, he emphasised that there are people in US and Israel who are also connected with the cause of Palestine, therefore we need to negotiate and involve them and we must not hate them. “India and Palestine have the right to stand for the freedom as the Indians’ fight against Britishers was the similar one. It was the fight against the coloniser. If someone calls Gandhi and Bhagat Singh or any other freedom fighter as terrorist then we must not accept that. Resisting the colonisers is the right of Palestinians, labelling them as terrorist is highly condemnable”, said Dr Omair Anas, Assistant Professor of International Relations, Ankara Yildirim Beyazit University, Turkey. Dr Anas tried to map out the transformations in India’s foreign policy towards Palestine. He compared the traditional stand of India with the stand of the current regime. He said that India has reduced its relation with Palestine to a relation of charity. “Palestinian struggle has to be more strategic. One of the biggest weaknesses of the Palestinian freedom movement is that Palestinians have not become self-reliant, they must understand that Yasser Arafat had self-determination which Palestinians need to carry further. Zionists are able to take over the whole world because of their well-planned strategies. We need to learn that”, said Prof Zikrur Rahman, former Ambassador of India to Palestine. Prof Zikrur Rahman talked on ‘Assessing the Peace Process in Palestine’. While discussing ‘Seige on Gaza’, Maphaz Ahmad Yousef said, “I and my family were not allowed to move out of Gaza several times. My sister could not move in and out of Gaza because freedom is strictly prohibited which denies us the right to free movement”. “Israel built an electronic fence and concrete wall around the Gaza Strip in 1995, while creates a barrier in interactions between the split Palestinian territories. Till now Gazans face an extreme shortage of fuel, food, water, healthcare facilities, and electricity. Its development is reversed”, she added. The Palestinian filmmaker, Anas Karmi talked about the importance of media and film making in changing perceptions. He screened his film ‘ 100 Balfour Road’ which left the audience in shock and tears. Muhammad Makram, President of Asia Middle East Forum shared his views on ‘Myths about Israel’. He talked about ten common myths regarding Israel by giving reference to Shlomo Sand’s book ‘The Invention of the Jewish People’. Apart from discussing the victimhood politics of Israel, he introduced to the Indian audience a lot of other references to understand the current colonising and brutal policies of Israel.